After the Blackfoot, this is the second car I've made for Re-Volt. It's the Tamiya Monster Beetle, which was originally released in 1986. In 2016, the Mall Crawler was re-released, but some details was changed (for example the BFGoodrich-brand). I've decided to do a remake of the Original '86-version. As a basis, I took the classical Baja Bug from scloink (which was also the basis for Badjam). I adjusted or made details, like a new front bumper, back bumper, circle headlights, added shocks, and so on. Iron Bob was so kind, to make some AWESOME wheels for Monster Beetle. They look incredible. I can't thank Iron Bob enough for them. ;) The parameters are completly new, it have nothing in common with Baja Bug or Badjam. I took the parameters from Blackfoot, and added some values from Bertha Ballistics. In the end, I tried to find a good combination, so the car drives well with his RWD drive, which was not so easy, but I think it worked fine in the end. As written above, the car has a rear wheel drive. The Original Tamiya model has as well, and I wanted to do a proper replica of this. Also the power of the car is not too high, so it fits the original. I would put the car into the Slugs-Class. With a little bit of training, it's also possible to win races against Aquasonic, Matra XL, R6 Turbo or Panga TC. It's a lot of fun to do races against Blackfoot with it. 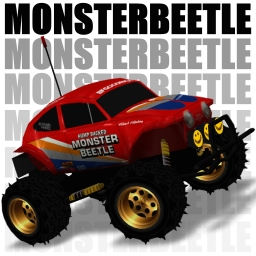 Blackfoot is faster, but Monster Beetle has a better steering and overall handling. In testing phase, I had some awesome and funny fights with this 2 cars. This was also one of my goals. Both cars was released in the same year by the same manufacturer (Tamiya), I'm sure a lot of people will have some childhood memories doing fights Blackfoot vs. Monster Beetle.